The voice in your head is a lie. What you hear when you open your mouth is distinctly less velvety than what everyone around hears—and it's your skull that's to blame. More specifically, it's the way your skull vibrates. Your voice emanates from from the lower portion of your throat, as expelled air from the lungs passes across your vocal chords, which vibrate to generate sound. This sound is then amplified by your voice box, modulated into words by your tongue and lips, and reverberated through the surrounding atmosphere until it enters your listener's ear canal to stimulate their eardrums and structures within the inner ear—which then convert the analog waveform to electrical impulses that the brain can understand. However, the inner ear doesn't just pick up sound from external sources. Vibrations emanating from within your body can activate these auditory structures as well. And when you speak, the rapid fluttering of your vocal chords actually causes your entire braincase to vibrate. 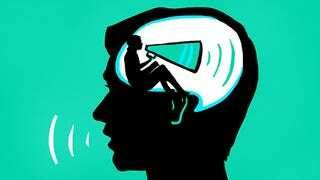 "When you speak, the vocal folds in your throat vibrate, which causes your skin, skull and oral cavities to also vibrate, and we perceive this as sound," Ben Hornsby, a professor of audiology at Vanderbilt University, told Popular Science. But sound doesn't travel through bone nearly as easily as it does through air. This added resistance causes the waveform frequency to drop, lowering the pitch of the sound you hear internally and creating a sort of feedback effect that stimulates the eardrum from both sides—that is, the eardrum picks up both the external stimulus of words that are coming out of your mouth as well as the shaking of your skull. This effect is heightened by the fact that you really can't hear your own voice directly. Because your ears are positioned behind your mouth (or at least they should be—looking at you, Sloth), the sounds coming out of your mouth must first bounce off objects and back into your ears. This too causes the waveform to lose energy as well as, in turn, frequency and pitch, resulting in you hearing a distorted, lower tone than what people hear directly from out of your mouth. These two tones—both internal and external—are then recombined by your brain into a single audio signal that you identify as your voice, albeit one with added bass.